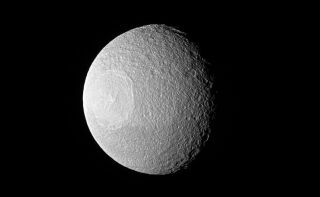 Tethys, one of Saturn's larger, icy moons, offers an eerie look into space. The moon's massive crater Odysseus and its central peaks give the illusion of an eyeball gazing up into the distance of the cosmos. Cassini captured the image with its narrow-angle camera on Nov. 10, 2016. Peek-a-boo, Tethys! NASA's Cassini spacecraft plays a cosmic game with one of Saturn's larger, icy moons. The moon, its vast crater Odysseus, and the crater's central peaks resemble an eyeball staring into the great beyond. "These impacts are a prime shaper of the appearance of a moon's surface, especially when the moon has no active geological processes," NASA officials wrote in an image description. In this case, a large impact not only created a crater known as Odysseus, but the rebound of the impact caused the mountainous peaks, named Scheria Montes, to form in the center of the crater." Cassini captured the view of Tethys from the leading side with it "gazing" north. The spacecraft's narrow-angle camera snapped the image from a distance of about 230,000 miles (370,000 kilometers) on Nov. 10, 2016. NASA released the image on Monday (Jan. 23). The Cassini spacecraft is on a nearly 20-year mission to explore Saturn, as well as its moons and rings, like never before. The mission is a cooperative project between NASA, the European Space Agency (ESA) - which provided the Huygens Titan lander - and the Italian Space Agency. The Cassini-Huygens mission launched in 1997, gathering data on multiple planets as it headed for Saturn. The probe flew by Venus twice (in 1998 and 1999), Earth once (in 1999), and then zipped through the asteroid belt before making a flyby of Jupiter in late 2000. Cassini reached Saturn in 2004 and released ESA's Huygens lander to make its historic landing on Titan, Saturn's largest moon, in January 2005. It carried the European Space Agency's Huygens probe to land on Titan, Saturn's largest moon, in January 2005. Cassini was named after the 17th century Italian astronomer Giovanni Cassini. The mission has begun its final phase and will be deliberately crashed into Saturn late in 2017 to preserve the moons from contamination.